While the Whistler Valley is known globally as a world-class mountain resort and host of the 2010 Olympic Winter Games, its history is much more diverse. The Squamish and Lil’wat First Nations have been the ancestral stewards of these lands since time immemorial. Over thousands of years they built vibrant, distinct cultures through an intimate relationship with the natural landscape. For more information on the past, present, and future of the the Squamish and Lil’wat First Nations, visit the Squamish Lil’wat Cultural Center. The first non-indigenous visitors to the Whistler Valley were William Downie, a Scottish veteran of the California gold rush (a “49er”), and Joseph Mackay, a former Hudson’s Bay Company employee (a fur trader, not a retail clerk), along with four assistants and three Lil’wat guides. The party had been commissioned by the colonial government to explore the territory between Lillooet Lake (Pemberton) and Howe Sound (Squamish) in September 1858, hoping to find a better coastal access route to the booming gold mines of the B.C. interior. Their guides brought them along a series of pre-existing trails. The surrounding landscape impressed Downie and Mackay, particularly the remnants of a recent, massive landslide from The Barrier, above where Daisy Lake lies today. Dwindling rations, however, forced the men to press on to to the coast before exploring the surrounding mountains. The first pioneers to live on the land that the Resort Municipality of Whistler now inhabits arrived in the 1880s. By this point the Pemberton Trail had been completed, connecting Howe Sound through Pemberton to Lillooet and the interior. The original name of Whistler was Summit Lake, BC, after the lake that flows both north towards Pemberton, and south towards the coast. This lake, and the surrounding community, was renamed Alta Lake (Latin for “high”) sometime around 1910 to avoid confusion with several other Summit Lakes throughout the province. One of the first settlers to arrive was John Millar, a Texan with a checkered past. Millar supported himself through trapping and running a stopping house at the junction of the Pemberton Trail and what soon became known as Millar’s Creek, near today’s Function Junction. 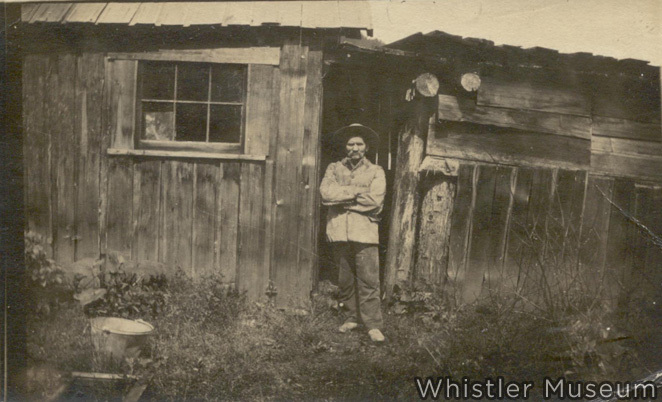 John Millar in front of his cabin, August 1911. In 1911, Millar met Alex Philip during a trip to Vancouver to sell furs. He invited Alex and his wife Myrtle to experience the superb fishing on the chain of lakes near his cabin. Myrtle and Alex Philip, both from the state of Maine, had moved to the west coast with dreams of opening their own fishing lodge and resort. 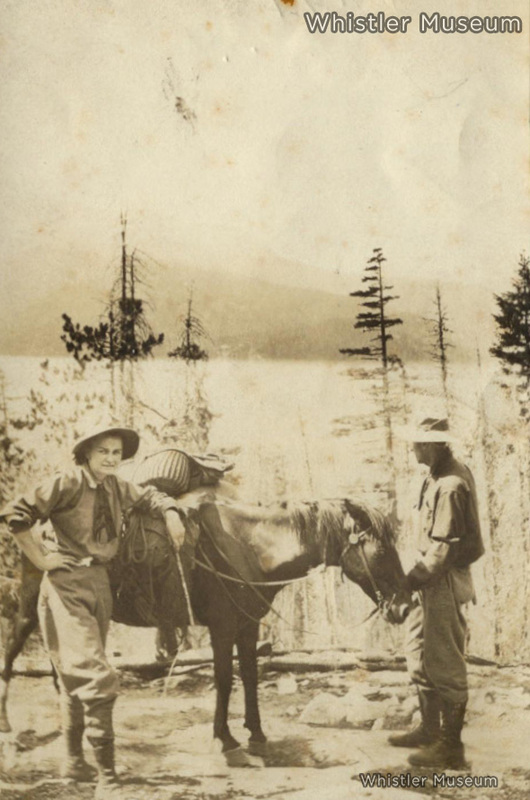 Myrtle & Alex Philip coming up the Pembrton Trail on their first visit to Alta Lake, August 1911. 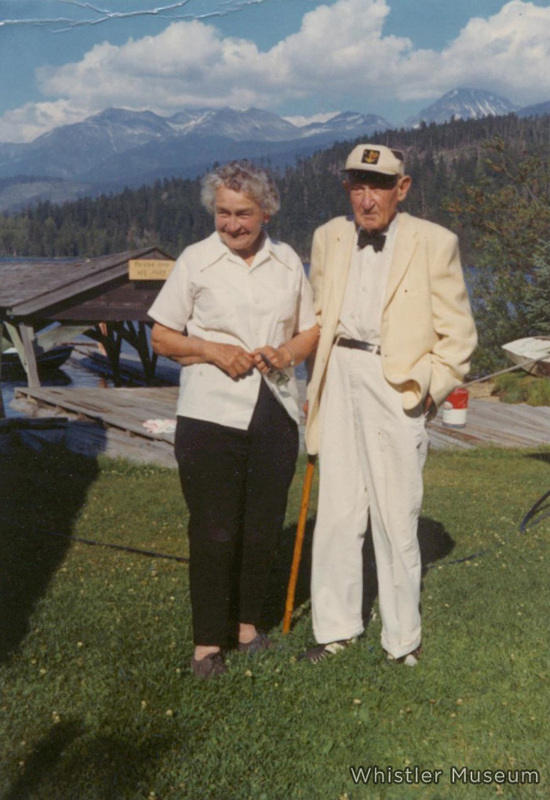 Over the next three years, the Philips visited Summit Lake several times. Back then, the journey from Vancouver took three days, requiring a ride on a steamship to Squamish followed by a two-day hike up the rough Pemberton Trail with rented pack horses. 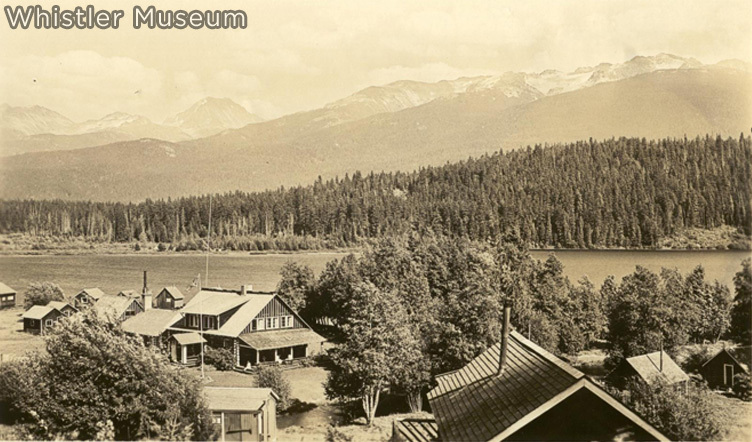 In 1913 the Philips purchased ten acres of land on the northwest corner of Alta Lake for $700, with the intention of building the wilderness fishing lodge of their dreams. Some of Myrtle’s family, the Tapleys, came from Maine to help with construction. By 1914 Rainbow Lodge fishing resort was completed. It had four bedrooms, a large living/dining area, and a kitchen. This was the same year that the Pacific Great Eastern Railway (PGE) reached Alta Lake and opened the valley to the outside world. The Whistler Valley was now accessible in a single day from a rapidly growing Vancouver. This level of accessibility, combined with legendary hospitality, a spectacular setting, and excellent fishing, allowed the Philips to expand Rainbow Lodge with cabins until it could accommodate 100 people. By the late 1920s it was considered the most popular tourist resort west of Banff. Rainbow Lodge and surrounding developments, 1930s. Alex Philip was an incurable romantic and writer of fiction novels. It was Alex who conceived such lyrical local place names as the “Bridge of Sighs” and the “River of Golden Dreams and Romance.” Much-loved for her strong, warm spirit, Myrtle was a tireless community organizer centrally responsible for many important developments such as the construction of the valley’s first school. Parkhurst Mill, with Wedge Mountain above. Winter 1936. The Philip’s operated Rainbow Lodge until 1948 when they sold it to Alec and Audrey Greenwood. After retirement, the Philip’s chose to live on Alta Lake for the rest of their lives. Myrtle & Alex Philip on Alta Lake, mid-1960s. Both had a chance to witness major changes to their beloved valley, as Alex passed away in 1968 at the age of 86. Myrtle lived until the ripe old age of 95. Today, one of Whistler’s elementary schools is still known as Myrtle Philip Community School, in honour of the legendary Whistler pioneer. Unfortunately, Rainbow Lodge burned down in 1977, but today the area has been renewed as Rainbow Park. Some of the original guest cabins and a replica of “the Bridge of Sighs” are still standing at the park, right next to Whistler’s largest public beach. Meanwhile, events during the early 1960s would change the valley forever. Inspired by the exciting success of the 1960 Squaw Valley Olympics, a group of Vancouver businessmen began to dream of building a ski resort and bringing the Winter Olympics to the Coast Mountains, just north of Vancouver. The Garibaldi Olympic Development Association (GODA) was formed, led by Norwegian-born Franz Wilhelmsen, and soon after, London Mountain in Garibaldi Provincial Park was chosen as their potential site. At this time there was still no road, no electricity, no piped water and no sewers servicing Alta Lake, at the foot of London Mountain. An official pamphlet promoting GODA’s 1968 Olympic bid. From 1962 to 1965 Garibaldi Lifts Limited, a sister organization to GODA, raised funds and began the development of the ski area. As well, in 1965 London Mountain’s name was officially changed to Whistler Mountain, which Alta Lake locals had always called the mountain because of the whistling sound of hoary marmots which greeted summer hikers. 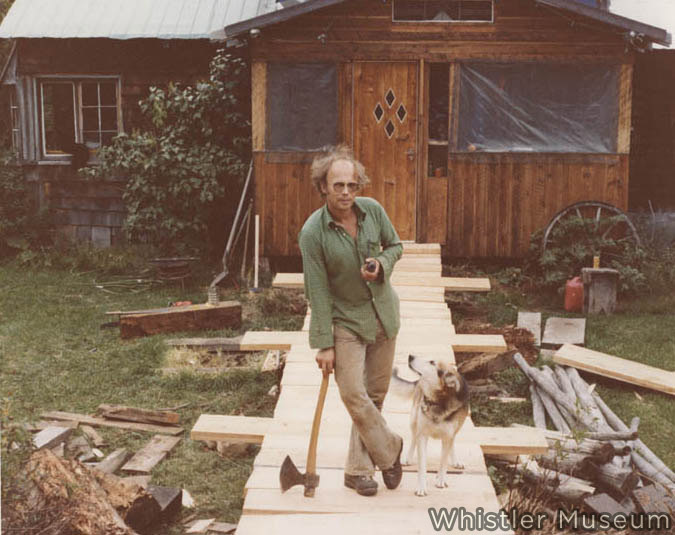 Building the original Roundhouse Lodge on Whistler, summer 1965. 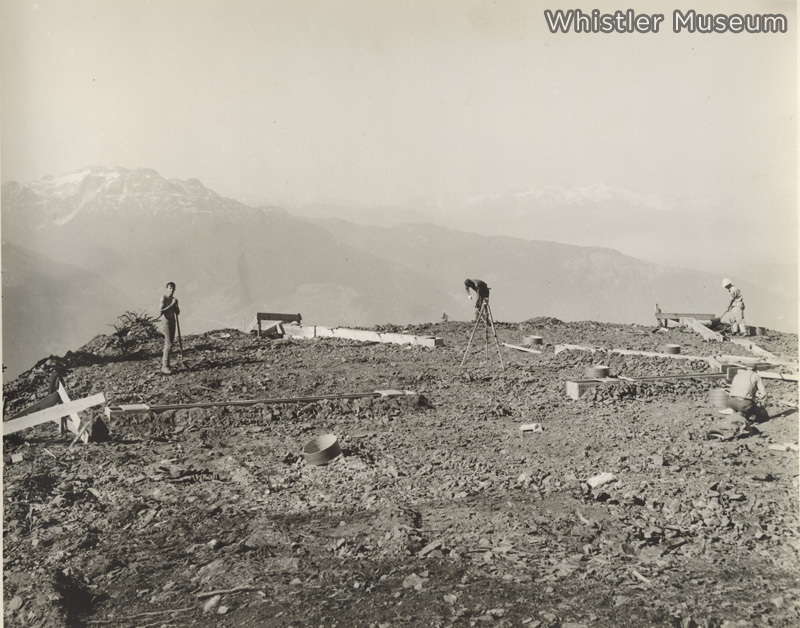 The first lifts were built on the south side of Whistler Mountain, starting from the area known as Creekside today (active mining claims prevented building lifts on the north side of the mountain). By the fall of 1965 several lifts had been installed, including: a four-person gondola to the mountain’s mid-station, a double chairlift to the alpine tree line, and two T-bars. A day lodge and several ski runs accompanied these new lifts. By 1965 the Provincial Government had completed a narrow gravel road from Vancouver, which followed a rough service road under the large hydro towers leading to Bridge River. That same year a substation supplied by the Bridge River hydro lines was also constructed, finally providing electricity to Alta Lake. 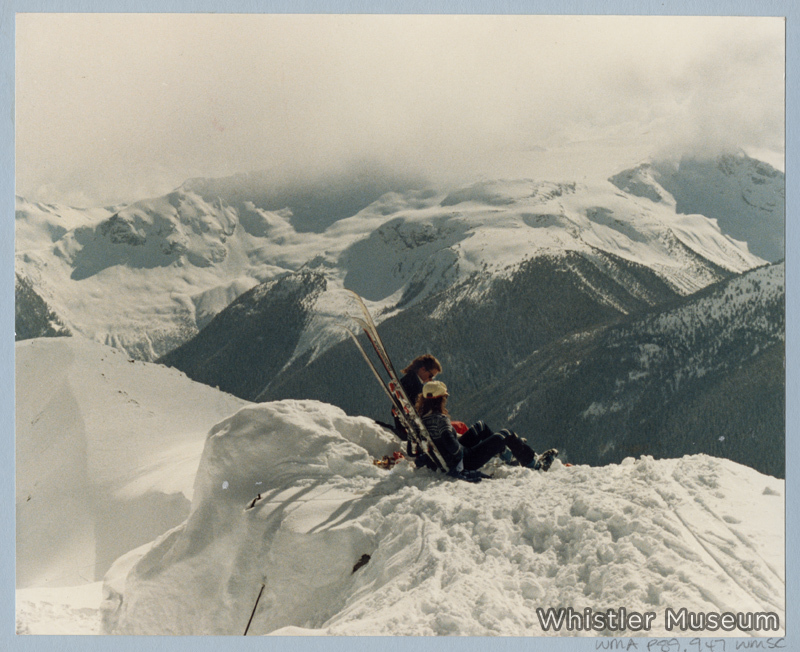 Finally, on January 15, 1966 Whistler Mountain officially opened for skiing, and a new era in Canadian skiing began. 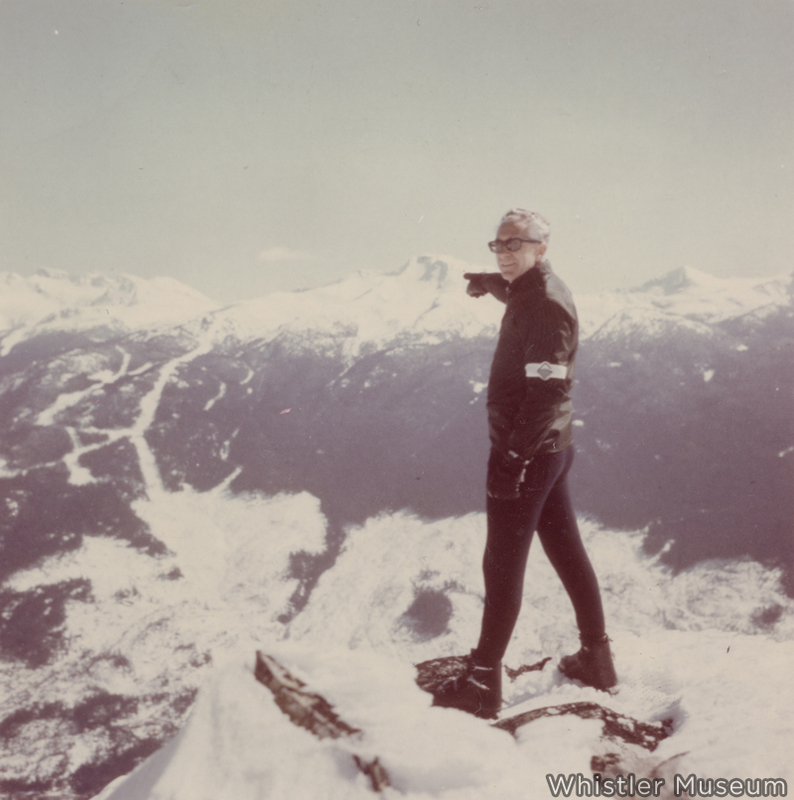 Franz Wilhelmsen points to his new ski resort, winter 1966. GODA made a total of four separate bids for the Winter Olympics. In 1968 Vancouver/Garibaldi won the Canadian nomination for the 1976 proposed site. 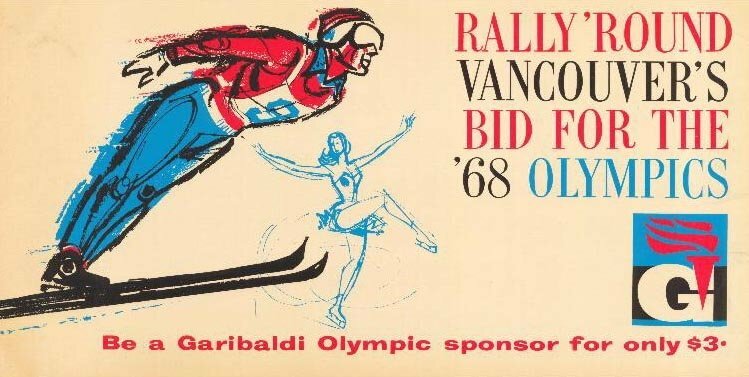 When Montreal was awarded the 1976 Summer Olympic Games, however, Garibaldi’s bid ended as the International Olympic Committee (IOC) would not allow both summer and winter games in the same country. Fuelled by the ski area’s success, Alta Lake began experiencing rapid, unplanned, and somewhat chaotic growth. Condo developments sprang up around Creekside and elsewhere in the valley. Meanwhile free-spirited ski bums who wanted to ski tons and live on the cheap began occupying empty buildings (such as at Parkhurst and the infamous Toad Hall, an abandoned logging camp) or building their own rustic cabins, often squatting on crown land. George Benjamin outside one of the most renowned dwellings of the era, Tokum Corners. Unlike many ski-bum homes, it was legal. In 1974 the Provincial NDP Government was interested in developing tourism in BC and took a number of steps affecting Whistler. This included a land freeze and a development study which resulted in the creation of the Resort Municipality of Whistler on September 6, 1975, the first resort municipality in Canada. In 1977, calls for development proposals for Blackcomb Mountain were issued and a community plan was visualized which saw the creation of a tourist village where Whistler and Blackcomb Mountains converge. At the time this site was the community garbage dump. 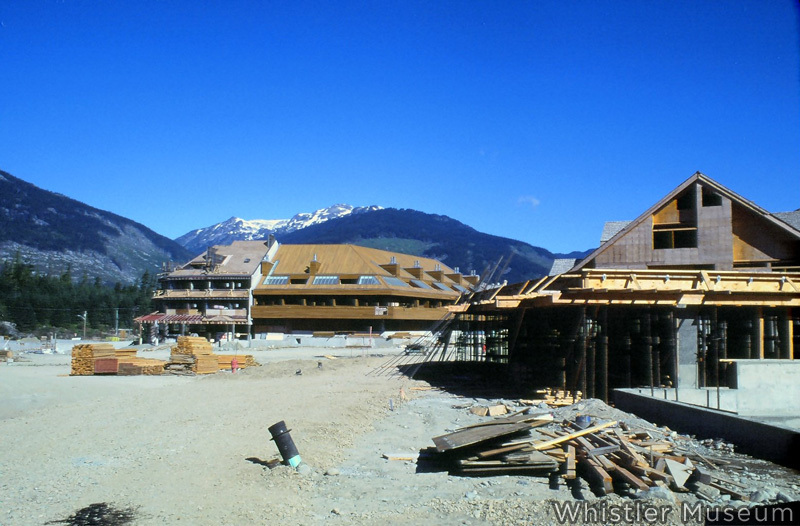 Whistler Village under construction, summer 1979. Blackcomb Mountain opened as a separate ski area in December of 1980, creating one of the largest ski complexes in North America. Whistler and Blackcomb boasted the two longest vertical drops of any ski areas on the continent. With the new village and rapidly expanding ski areas, the pace of change in the valley accelerated further. Skiers break for a picnic on Whistler Mountain, 1980s. In 1992 Snow Country Magazine, one of North America’s most prominent ski magazines, voted Whistler Resort the Number One Ski Resort in North America, the first of many accolades to come. In 1998 Whistler and Blackcomb Mountains merged under the direction of a company called Intrawest, a move many saw as inevitable. The following summer the Whistler Mountain Bike Park opened, quickly becoming a global attraction in its own right as Whistler continues to evolve into a year-round resort. Finally, on July 2, 2003 a dream almost fifty years in the making finally came true. 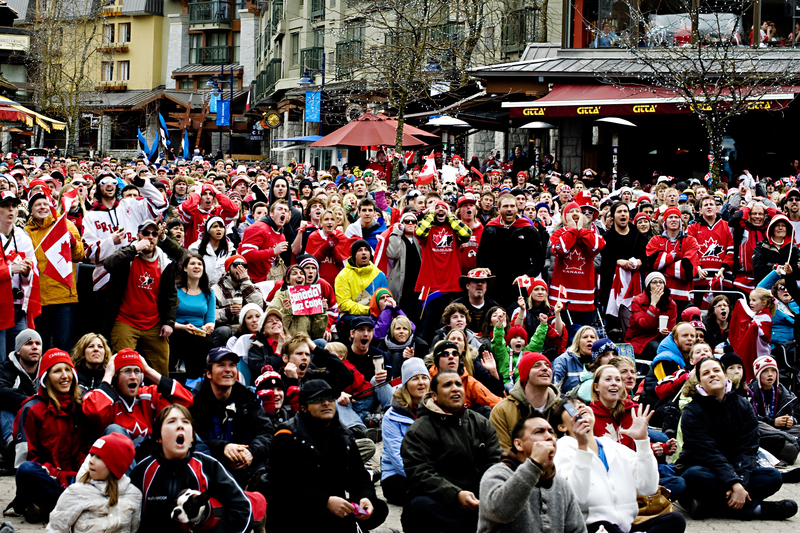 Whistler, in partnership with Vancouver, won the bid to host the 2010 Winter Olympics. Once again development in Whistler (and Vancouver, as well as along the Sea-To-Sky Highway which links the two) skyrocketed. On February 12, 2010, the official opening ceremonies of XXI Olympic Winter Games took place in Vancouver. From then until March 19, 2010, Whistler welcomed the world and celebrated the reality of it’s Olympic Dream, with the Paralympic Games closing ceremonies taking place in Whistler Village. Crowds watch the Gold Medal hockey game in Village Square. Photo: Anastasia Chomlack / RMOW. Today, a post-Olympic Whistler is deciding what comes next. A changing global economy and a changing climate are leading many to strive for diversification of our economy beyond skiing. Others insist that enough is enough, that decades of outward and upward expansion must be halted if we are to preserve our region’s natural charms. As our nearly 10,000 permanent residents look to the future, it seems certain that the coming 100 years will be as exciting and unpredictable as the past century. 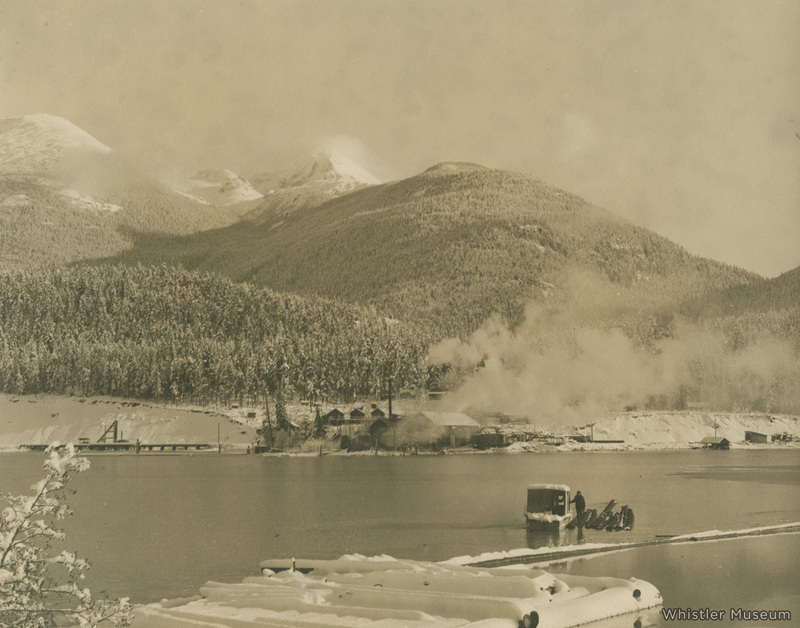 In addition to the stories shared on this blog, more on-line content on the history of Whistler can be found on our main website, as well as two online historical photo collections produced by The Whistler Museum and hosted by the Government of Canada Library and Archives. I love the site, especially the old pictures. One comment: It seems misleading to refer to the Peak to Peak as connecting “the summits” of Whistler and Blackcomb. This implies the lift goes from one summit to the other. Perhaps it would be better to say it connects “the alpine areas”. Good work! Love the picture of Parkhurst. I have never seen this picture before. Thanks Mark, glad you liked it! The Parkhurst photo was new to me as well. There are still tens of thousands of photos in our archives that I’ve never had a chance to look at, so we’ll probably uncover plenty more gems in the future. Great site. I as well was pleased to see the old Parkhurst shots. I recently saw an old map of BC released by the City of Vancouver archives and I was wondering why other nearby mountains were labelled, but Whistler wasn’t there. The article says that Whistler was originally called Summit Lake. I guess that explains it! Great work. Need to expand on when Alpine and Emerald were built. Also the link to your website didn’t work for me. We hope to be increasing our information on Alpine and Emerald soon as we recently received donations that deal with the development of both neighbourhoods! Thank you for letting us know about the link – it has now been fixed and should take you to the Whistler Museum website. We do have some information but our Ski Rainbow collection is not nearly as big as it could be. We’re always looking out for new information and hope to be growing our collection on the subject soon. Ski Rainbow is a very important part of Whistler’s history as well as your family’s and we know there are many people in town who still remember the times they spent skiing and working there. If there’s any information you’re looking for or you would like to contribute to the information we do have, please don’t hesitate to come by the museum or contact our Collections Manager at archives@whistlermuseum.org. Does the museum plan on presenting any of the history of the Jordan family in the future? We do not currently have any specific plans, though we do try to share the history of as many individuals and families from Alta Lake as we can through our weekly column, photographs and this blog. We do have some information on the Jordan family, mostly about Russ Jordan and Jordan’s Lodge, but the history of the Jordan family at Alta Lake is certainly not complete. We hope to share the information we do have soon! I am in Whistler annually to visit my son and his family. I am intrigued will the bike trail named “Lucy in the Sky with Diamonds”. Could you please enlighten me as to the history of this trails name? We’re not familiar with a trail of that name – whereabouts did you come across the trail?